The best of Tuscany and Umbria all in one holiday? It is now possible, in this beautiful villa situated on the border between these two popular areas. You have access to a shared pool, plus a beautiful garden where you can easily unwind. Sit down for a lovely meal just around the corner: the owners have a restaurant/pizzeria next door. 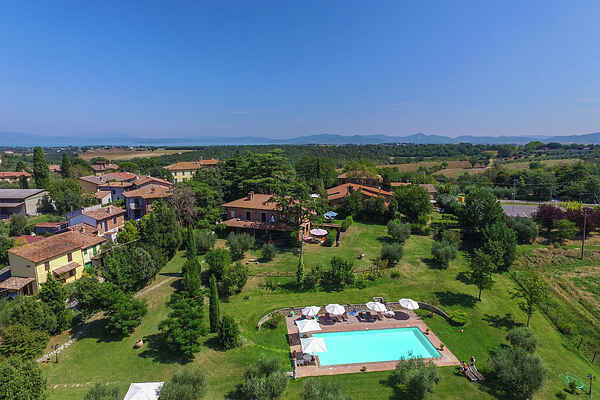 On the Umbria side you are close to Castiglione del Lago (8 km), a historic little town with panoramic views over Trasimeno Lake. Here you can go for a nice stroll in the afternoon, before going out for dinner at one of the charming restaurants. For active holidaymakers there is a tennis court nearby (3 km) and to discover the surrounding area the Borgo offers mountain bikes. Bakery and grocery store in Badia (200 m). Post office, bank and supermarket in San Fatucchio (5 km). Riding stables in Castiglione del Lago. On the side of Tuscany lies Montepulciano (30 km). The town's old centre and its location on top of a hill make this well worth a visit! Other must-sees are Cortona (25 km) and Siena (90 km) in Tuscany and Città della Pieve (25 km) and Perugia (45 km) in Umbria.